Some of Acadiana’s best help French rock legend Charlelie Couture with a brand new record and a performance at Festival International. 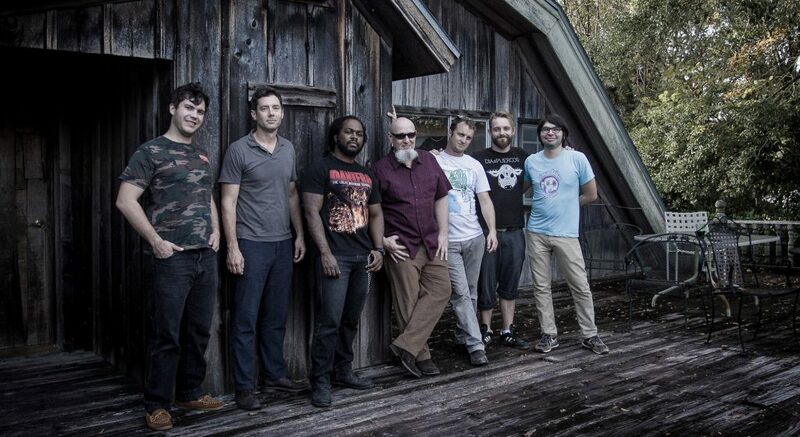 CharlElie Couture, center, is flanked by his producer Karim Attoumane, third from left, and members of Lost Bayou Ramblers at Dockside Studios. Couture made his upcoming record Lafayette with the help of many notable Lafayette-area musicians. When dealing with an exotic musical legend, it’s tempting to introduce the figure via his/her backlog of accomplishments. Often, that comes at the expense of a thorough investigation of the artist’s contemporary work. With the help of a cross-generational cast of Acadiana’s best and brightest musicians, French rock and roll treasure CharlElie Couture is set to release one of the most playful and internationally accessible records in his catalog: an ode to the Louisiana of his childhood fantasies called Lafayette, out April 29. Couture will play many of the tracks off the record â€” featuring many of those same musicians â€” at a rare American performance at this year’s Festival International de Louisiane. The recording drips with swamp water, sloshed on by the bucketful thanks to Couture’s Cajun-studded sessions at Dockside Studios in Milton. Rarely does an appropriation of local flavor and talent work so well and so diversely, and rarely does the visitor get such a massive turnout of Acadiana-residing, world-class musicianship. The two-week stint featured members of Lost Bayou Ramblers, Feufollet, percussionists Roy Durand and Story Gonsoulin, chanteuse Julie Williams and legend Zachary Richard, among others. On â€œStuck In The Mud,â€ the record’s first single, it’s obvious how conversant the chameleon Couture is with Louisiana folkways. Swells of brass answer sweaty calls from Richard Comeaux’s pedal steel in a dense but discernible stereo field, all anchored by the reedy breath of Chris Stafford’s (Feufollet) accordion work and a rollicking honky tonk piano. Couture came to Louisiana seeking a taste of a world his mother discovered as a French teacher in post-war America, traveling between Wisconsin and Alabama. The record is more blues than bayou boogie, leaning heavily on grimy slide guitar work and Couture’s nasal drawl. But the blend of culture and instrumentation gets unity from Couture’s uniquely French voicing. The video for â€œStuck in the Mud,â€ or “Debout dans la boue” in French, conjures even more familiarity thanks to appearances by local notables such as GIVERS members Josh LeBlanc and Tif Lamson, as well as Lafayette-area swamp rock shaman Hart Fortenberry. While he is not the first international artist to fetishize southern Louisiana as a trove of roots, Couture’s eclectic philosophy of art makes him uniquely suited to synthesizing a new perspective on Southern folk and blues traditions. As a child of the 1960’s and 1970’s European rock scene, Couture breathed the ether of American roots through artists like Bob Dylan, JJ Cale and Tom Waits. Critics have long found kindred eccentricities between Waits and Couture, leading many to outright comparisons of the two. Considering the breadth of his musical output, at present over 25 albums and 16 soundtracks in total, it’s not surprising that Couture has enjoyed such illustrious comparisons, Anglo-centrism not withstanding. The man is an artistic force in the Francophone world, the sort of figure mobbed with media attention in his native country, but largely ignored by English-speaking audiences. That anonymity has been a boon to Couture’s career as a visual artist. Back in the early 2000’s, Couture expatriated to New York City, establishing a gallery and studio from which he produces pop-influenced expressionism that beats in a definitively American rhythm. He’s long said in interviews that his notoriety as a musician in France had prevented him from being taken seriously a visual artist, despite decades of steady and impressive work in painting, sculpture and photography. This, of course, all sounds like press clipping mumbo jumbo, but take a look at his online gallery to see for yourself. Of particular interest to you may be his renderings of video game characters on shower curtains. His routine reinvention is part and parcel of his work as a pioneer in the â€œmultistsâ€ movement emanating from northeast France in the mid-to-late 20th century. Multism, so-defined, is a reaction to what Couture calls â€œspecializationâ€ in the arts. Conventionally, Couture argues, artists identify by singular media. Musicians make music. Painters paint. Writers write. Couture does all three, and more, with remarkable technical proficiency. Speaking with him is opening a mind humming with ideas. Couture’s performance at Festival will mark only the fifth or sixth time the artist has performed his music in the United States. This year Festival has refocused its energy on its Francophone roots, opting to place Couture in the Thursday night slot, of late typically held by more well-known American acts. He may not yet be well-known in America, but this appearance will put a legendary stamp on Festival’s 30th Anniversary. CharlElie Couture will perform at Scène Cypress Bayou International on Thursday, April 21 at 9:45 p.m.